Every year Royal Bay Nursing Home, Claremont Lodge, start their Hatching Project in the spring. This year is no exception, with the care homes Activity Co-ordinator, Laura, bringing in six duckling eggs from the local farm to hatch. Our residents at Claremont Lodge Care Home have just helped hatch the six ducklings using the incubator and brooder. Both the respite care and residential care home residents helped to choose some interesting names for the ducklings. From residents and carers to healthcare professionals and family members, everyone who visits the nursing home in West Sussex can handle the ducklings and watch them as they swim. 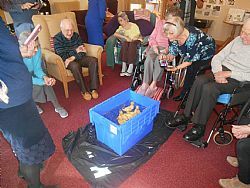 The bunch of cute little ducklings are very popular with everyone and very therapeutic for our care homes residents. We can’t wait to share them with our friends from Great Ballard School in April.